I thought it would be interesting to do a direct side-by-side comparisons and reviews of some of the different egg coloring kits so I purchased and sampled the following Easter egg coloring kits – Classic Easter Egg Coloring Kit by PAAS, Paas Color Cups, Speckle Easter Egg Coloring Kit by RJ Rabbit / Easter Unlimited, Speckle Easter Egg Coloring Kit by RJ Rabbit / Easter Unlimited and Tie Dye Easter Egg Coloring Kit by PAAS. Some of these reviews were done a year or more ago and companies often re-package and re-name kits and are always coming up with new twists. If you see a review on here you can’t find in stores or on-line, it has either been discontinued but more likely “rebranded”. 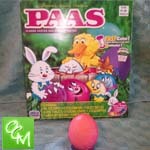 You should still be able to get the gist of what’s in the kit by these Easter egg coloring kits reviews. 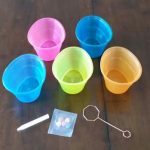 Summary – Simply toss the dye tablets in the cups, add water & vinegar, and dip the eggs in the color bath to dye the eggs or use the dipper to dip half the egg. You can use the “magic crayon” to decorate the egg invisibly before you dye the egg so when you dip it into colors, your design magically appears. You need your own egg stand to dry the dyed eggs. The box does not serve as an egg drying stand which is this kit’s only drawback. Colors are bright and true! Full review – pics. 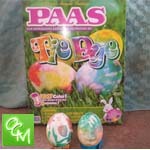 Summary: This Easter egg coloring kit was by far the easiest to use and would probably suit the youngest kids best. Simply dissolving the tablets in a vinegar/water solution and dipping the eggs is easy, and neat. Very little mess with this Easter egg coloring kit earns it a 5 in neatness. I gave the end result a score of 4 because no matter how long I kept the egg in they dye, it never turns out as bright and colorful as it appears on the box, even if I use the “bright” coloring instructions. Being that there’s little creativity involved, the fun factor came in at 2. 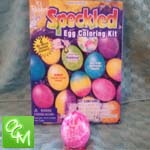 Summary: The Speckle kit came with mini sponges and paints. You pour the paints into the provided tray and then dip in the sponges to do some sponge painting. I gave the Ease of Use a 3 because you have to have the right amount of paint on the sponge to get the sponge effect, otherwise, it will just look painted. Neatness is a 3 because it’s tough to hold onto the egg and sponge paint it at the same time. The end result is debatable since it doesn’t look like the pictures on the box, but it’s close if you take your time to try to duplicate it and use the right amount of paint. The fun factor score is a 4 because you can get creative with the different colors – kind of like the sponge paint job you’d do in your bathroom back in the 80’s. Summary: This was the worst Easter egg coloring kit ever! It was so bad, I will never buy it again. Basically, it was pretty easy to apply. 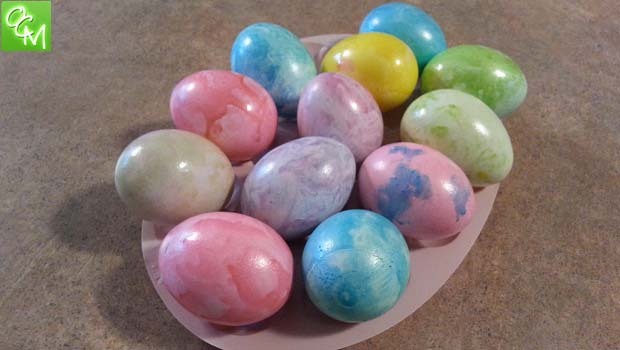 Using a paint brush and some paint that you squirt into the paint tray, paint the Easter egg horizontally while holding the top and bottom with two fingers. Set it up to dry, and then do the top and bottom. Not messy at all, hence the high scores for ease of use and neatness. However, the stuff never dries! It stays sticky. Also, if any part of the Easter egg got any type of oily residue on it (even from the natural oil on your skin), the paint will just bubble and crater and not go on thick and evenly. The paint that does go on evenly will look shiny like a candy apple, but what good is it if you can’t pick it up or peel it without dyeing your own fingers?! Plus, all the colored Easter eggs stick to one another and the designs get all messed up. I gave the fun factor a 3 because kids can paint different designs and get creative. Summary: This one was the most fun Easter Egg Coloring Kit, but should definitely be reserved for the older kids. The difficulty level is high for the style I purchased which included a plastic casing that you poked holes through and lined it with a cloth on each side. The egg gets put in the middle and you inject small amounts of ink into each hole. It’s a tough concept to explain, but for the kids, it becomes an art project. It takes a while and only one person at a time can use the Easter egg coloring kit. But, it’s not messy and the end result (if you spend enough time on it) is pretty cool and looks very similar to the pics on the package. If your kids are big on art projects and will enjoy each egg looking completely different, this will be a fun Easter egg coloring kit for them. 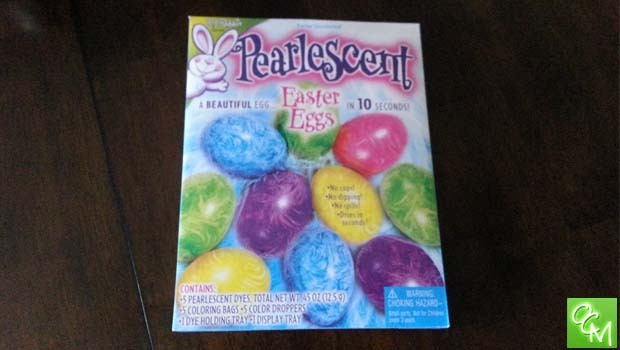 In this situation, the eggs did not come out as “pearlescent” as the pics on the box and we used every drop of paint. Another issue with the Pearlescent Egg Coloring Kit is that you can’t really creatively explore anything but a solid color design. It’s too difficult to create a design or combine two colors. 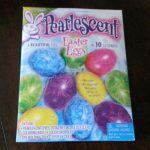 ON THE PLUS SIDE – The Pearlescent Egg Coloring Kit is not as messy as other kits. Plus, it washes off hands quick and easy. The dye was not staining our hands at all. Once we got into a system that worked in place of the droppers, the egg coloring was very simple. Actually, my kids said it was done too fast to the point where it just wasn’t fun! I actually thought it was nice to finally have an egg coloring event that didn’t last all day and lose their interest. 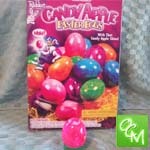 See related posts for more Easter Egg Coloring Kits reviews.